Plays "Whistle While You Work". A bravely balanced unicyclist juggles as he mixes and beats the eggs. 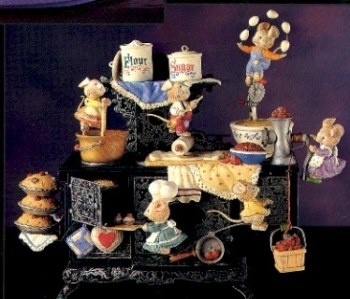 Another little baker rides a spoon, stirring batter which is flattened by a roller-pin riding mouse. Next, berries are pressed through a grinder, and mice teeter-totter on a spatula as the head chef removes pastries from the glowing oven. Another fascinating Small World of Music creation from Enesco artist Karen Hahn. 7 1/4" high Manufactured 1993 Perfect condition, but no original box.